Carshalton High Street hit 27 degrees today as thousands of spectators turned out along the High Street and the famous Ponds to welcome the 2012 Olympic torch relay. “I’ve had an amazing day, I love living here,” said Carshalton Mum Anna Matthews; “I’m proud to live in Carshalton” agreed Carshalton Mum Emily Ruiz. Among those on the stage were All Saints Primary School Choir, giving up the first day of their school holiday to wear school uniform. Council estimates were that 5,000 people lined the streets of the town centre to welcome the torchbearers, with another 10,000 filling Sutton High Street. While official police figures showed an amazing 45,000 to 50,000 spectators saw the torch go through Sutton. The Gary Mason drummers also played throughout the day, delighting local children with the chance to join in. 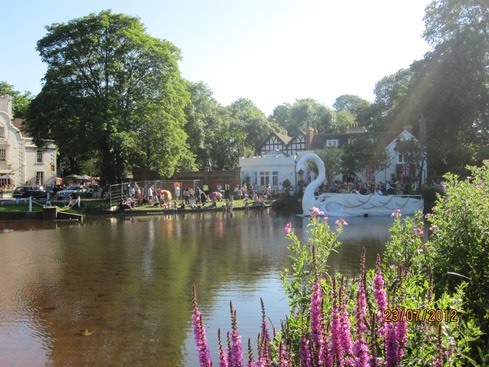 The swan-shaped stage also boasted a knitted swan mascot on the water beside it that was created by the mystery yarnbombers - the Wooley Coven of Carshalton. Festivities continued long into the evening in Carshalton, with streets, pubs and parks overflowing with locals enjoying the beautiful weather and historic atmosphere.